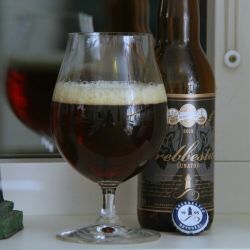 Lunator är en dubbelbock som bryggmästaren sätter under årets första fullmåne. Ölet jäser i lugn takt och tappas lagom till våren. Lunator har välbalanserad fyllighet med tydlig eftersmak av malt och humletoner. Servera gärna ölet i cognacskupa. UPDATED: DEC 31, 2018 [email protected]'s Summer Tasting, Malmö (30/06/2018) - chestnut brown pour with off-white head. Sweet toasty and roasted malty prominent caramel notes, some treacle, cocoa, brown sugar, medium body, sweet roasted malty finish. UPDATED: JUL 22, 2018 Mörkbrun med tunt beige skum. Doftar syrligt, maltigt, lite sött. Smaken fyllig, sötsyrlig, lite malt och choklad Eftersmaken hyggligt lång med syrliga, lite söta, toner. Något tunn. 0,33 flaske fra Systembolaget Hansa (Malmø), delt med Einar mai-18: brunsvart med ok skum. Saftig og god aroma av svisker, rosiner, knekk og mørk sjokolade. Mørke karameller, kaffe og modne bjørnebær i tillegg i den fyldige smaken. Allikevel svært lettdrikkelig og med godt avstemt bitterhet i finishen. Elegant. Bottle @ home. Had a vertical session with 2013/2014/2018 vintages. 2014 (4 years) stand out as the winner with smooth vinous notes in contrast to 2013 which was rather dusty. Mörkrostbrun med lite skum. Luktar lite sött, vinaktigt. Smakar sött, torkad frukt. Lite bränt. Kort eftersmak. Pours a beautiful clear deep red color with very little off-white head. Malty aromas of bread, wood and nuts and it has a vinous aroma and some aroma of prunes and cherrys as well. Nicely complex and balanced. The taste is medium to high in sweetness, low in bitterness and lightly acidic. Flavor notes of dried fruits and red wine. Has some off flavor I am not quite certain of. Might be a little wet cartboard. Besides this it is quite pleasant. Pours dark brown with a light toffecoloured foam. Nose is dried fruits, some toffee, sweet. Light bodied, a bit thin mouthfeel. Dried fruits, plums, hint of roastiness, hints of coffee. Mörkt bärnstensfärgad mot brun öl med ett lättare skum. Doft och smak av malt, mörka frukter, mörkt socker och lätt kryddighet. Creamy aroma full of vanilla, espresso, and chocolates. Taste is sweet, creamy, milk chocolate with vanilla notes. (Bottle, 0.33 l - BBE 10/17, from Systembolaget, 20170414) The beer poured dark brown and clear. The foaming was aggressive and the resulting colour was lightly brown. Aroma had caramel, sweetness, malts and sweet chocolate. Palate was medium bodied with medium carbonation. Flavours were malts, caramel, molasses, excessive sweetness and bitterness. Aftertaste was ma, sweet and bitter. A way too sweet brew with lightly wine like notes.